We’d love your help. 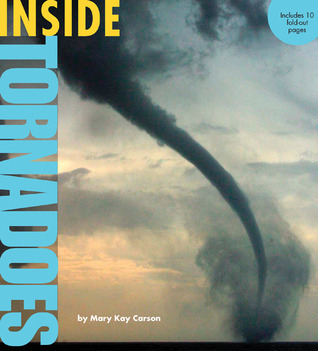 Let us know what’s wrong with this preview of Inside Tornadoes by Mary Kay Carson. To ask other readers questions about Inside Tornadoes, please sign up. I liked this book. I felt it was very informative. I like how it shows you how tornados are formed. I liked how it shows pictures of the different types of tornadoes. It shows you how to demonstrate a tornado to the students, by using plastic bottles. I also like how it gives history of some of the major damages the tornadoes have done in the past. I would use this book for a lesson plan to teach the children about the different types of the weather. I would set up in class experiences so the chi I liked this book. I felt it was very informative. I like how it shows you how tornados are formed. I liked how it shows pictures of the different types of tornadoes. It shows you how to demonstrate a tornado to the students, by using plastic bottles. I also like how it gives history of some of the major damages the tornadoes have done in the past. Audience: This book would be good found students in grades 4-6 and for any gender. Appeal: This book is appealing because it explains the real facts about tornadoes and how harmful they are. It also uses vivid pictures. Application: I would use this for a science lesson about weather. I would use it in the Spring since that is tornado season.